IT WAS good to catch up with Wayne Farley from Burnie the other day when he pulled in to the new parking area around the back at Mood Food for a quick bite to eat and a cuppa. 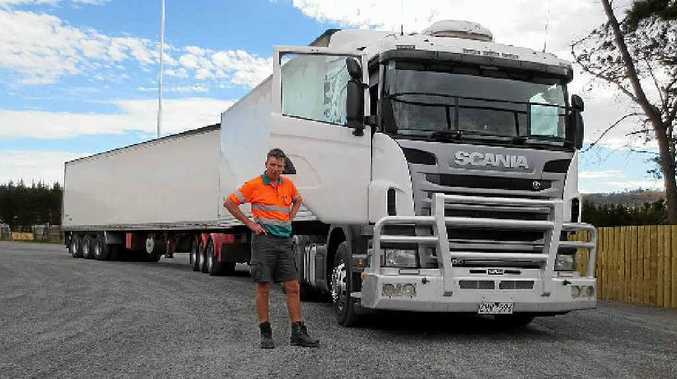 He was driving a 2010 Tolls R480 Scania and towing a refrigerated B-double at the time. He had been doing distribution around Hobart, including Bridgewater and Northgate, and was on the return leg to the TRDC. He tells us he has been with Toll for four months and is finding it a great job so far, with a really good crowd of blokes, plus being close to home. He said that, like a lot of people, he had had his cases packed at the door with the recent Montumana bushfire far too close for comfort until the firies brought it under control. He asked us to express his thanks to the blokes who work so hard to keep the community safe.